It’s been a pivotal and record-breaking year for us – a real turning point for Para-Sols as we moved into our next stage of growth as a company – and the success of The Grad Scheme certainly played its part in all that we’ve achieved. Successfully recruiting our first graduate position way back in 2013 proved to be the inspiration for creating our own graduate training programme. After a number of other successful appointments over the following years, we formalised our training programme and “The Grad Scheme” was relaunched as its own brand in March 2017 and is a core element of our Five Year Plan growth strategy. This year we’ve invested a huge amount of time and resource into creating a scalable infrastructure, one that also retains our world-class quality, meaning we’ve been busy formalising our training framework, launched a number of learning and development initiatives internally and restructured / recruited new roles to manage mentoring, operations and quality. With all of this now embedded, we expect The Grad Scheme to go from strength to strength and have our first recruitment day booked in for April 2018. There will be a further three recruitment drives taking place next year, and as it was this year, our main aim is to find individuals with the right attitude, rather than the knowledge, meaning we have no set number of places available. We’re passionate about building the company with hard working motivated individuals and in return, offer a personalised career path which they can take ownership of and allow their ambitions to drive it forward. This year’s new starters have worked incredibly hard to listen and learn, have embraced the Para-Sols way, made a start on their Diploma in Financial Planning and generally all progressed through their training program at an incredible pace. After working his way through his qualifications and building his own team, our first ever grad (back in 2013), Grant, has recently been promoted to Head of Paraplanning and is an integral member of the team. As one of the first to join us this year, Holly, won ‘Best Newcomer of the Year’ at our annual Staff Awards which recognises hard work and personal achievement as well as commitment to the company. As with any change, it’s been a learning curve and not without its challenges but as 2017 closes, we’re breathing a huge sigh of relief, giving ourselves a big pat on the back as the bulk of the hard-work is now complete and shift our focus to reenergising ourselves ready for another momentous year next year. We’ll drink to that… cheers! You can read more about our new starters on the ‘meet the team’ page of the Para-Sols website. 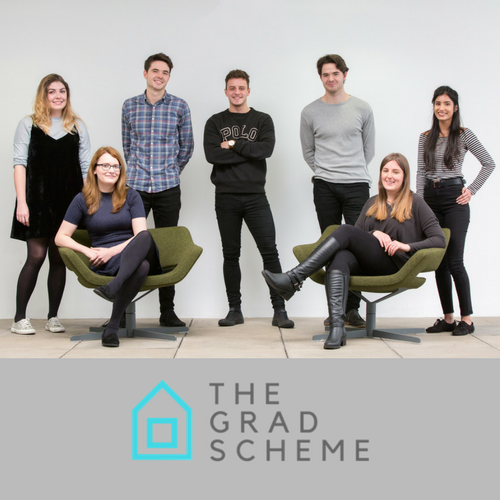 More information on recruitment for 2018 is available at www.thegradscheme.co.uk. Photo – back, from left to right: Holly, Matthew, Lee, Sam and Sunaina.